Rejoice in the holiday season! The holiday season is a time for reflection and spiritual rebirth. 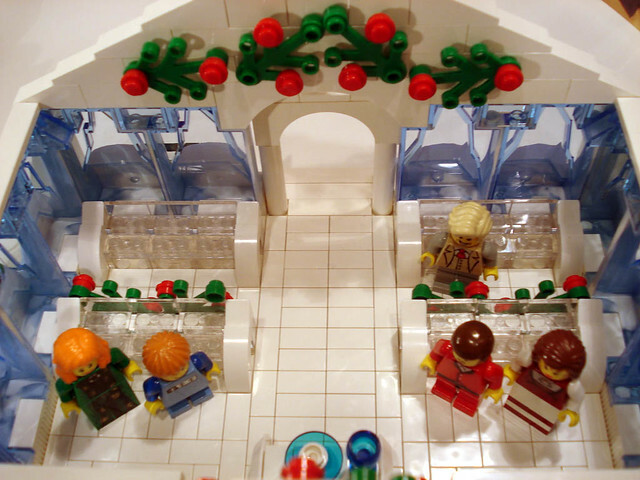 This scene from the Winter Village series includes a church built with walls of ice including the pews. A round stained glass window adorns the altar with an overhead chandelier. Two statues of saints on both sides of the altar and wreaths with holly complete the holiday interior. What better way to enjoy the ride on the sleigh with a reindeer after the service has ended. 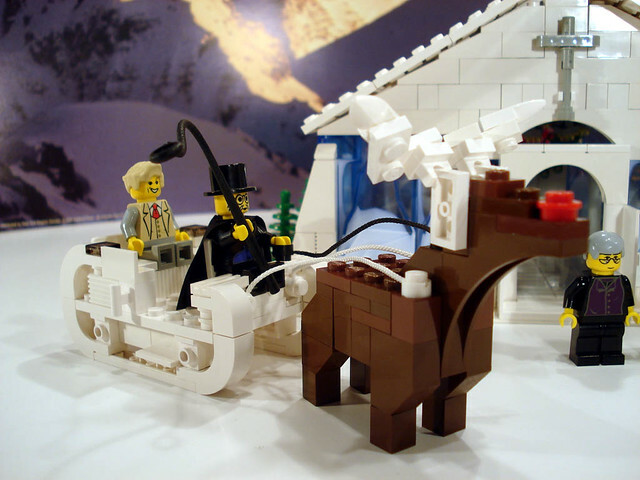 Includes 7 minifigs, 2 statues and a brick-built reindeer with custom sleigh. Very nice! I like how you used the BURPs! It looks like a Church in the middle of Antarctica though! The reindeer is a little blocky but I really like the minifigs and the use of the icy rock pieces. It reminds me about the famous ice-hotel in northern Sweden. Amazing work as always AC! I simply love the overall serene peaceful feel of the whole build. It's nice to see you build something 'small' for a change, and once again it doesn't disappoint since the design expertise is clearly evident on the clever use of those unique glass panes and the chandelier and glass mosaic details inside. Even the reindeer sleigh adds a nice touch. Good luck in the contest! 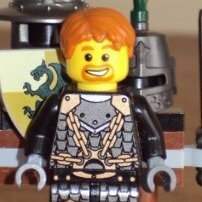 Just out of curiosity, does Lego actually do sets that reference specific religions? I had a vague feeling that this was one of their big taboos, like military sets. 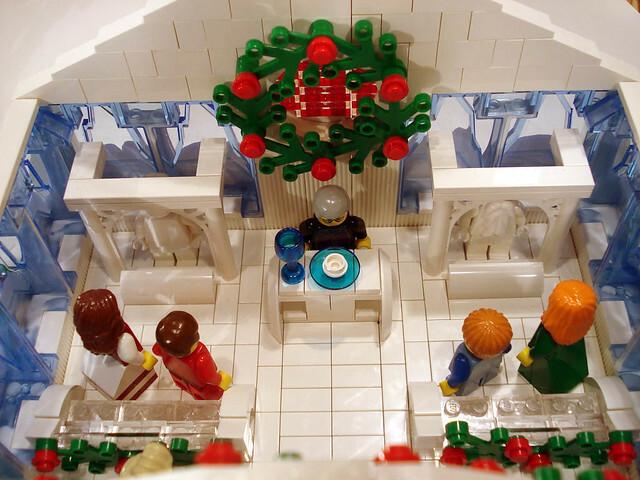 I don't remember ever seeing a church or any kind of temple in a LEGO set, unless you count temples to gods that haven't been worshiped since ancient times. (I don't mean to knock down your work, ACPin. It's a very pretty piece, especially the interior. Love that chandelier! I was just wondering if this was the kind of thing that TLG would actually endorse. 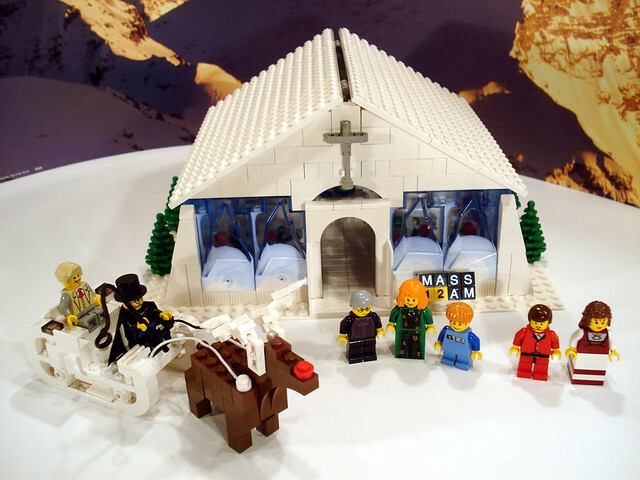 The only religious reference I can remember seeing in LEGO is the advent calendars and the Christmas trees, and I don't even think they ever come out and call them Christmas trees, do they? I love your Winter Church! It looks great! An excellent MOC from the Star Wars MOC-Genius 'ACPin'.....good luck and keep on singing those hymms ! I likle how You used Ice for the walls, However it takes out some sweetness on the inside. I like it--although I feel that the poor parishioners are going to freeze their rear ends off while sitting on those ice pews if the sermon is too long! Nice-- That'd be my pick if I had to choose next year's Winter set-- a beautiful grey stone church with snow on its peaks, complete with a minifig Nativity scene outside. Probably closer to the $100 range but I'll pledge my money now, TLG! 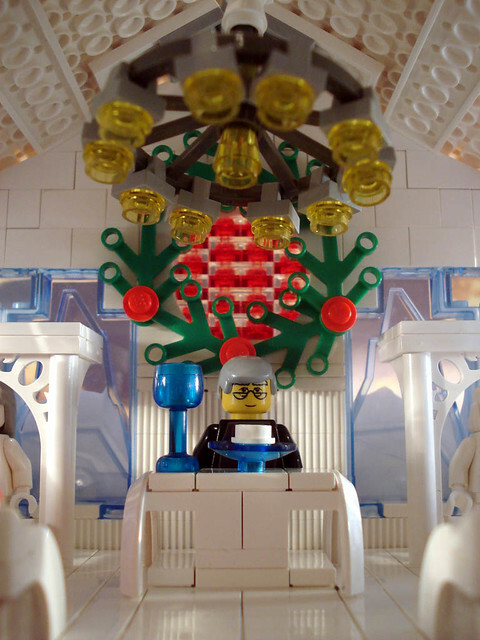 Great entry, I like the minifigs used and the ice windows. No Lego don't see religious models as part of the Lego 'ideals'. They specifically request Lego Certified Builders to avoid religious and military themes. I'm pretty sure they want to avoid being divisive, since the founder of Lego was a religious person. This one is very nice and I like the minifigures! The interior is very well made! At least it won't melt right away! The reindeer was designed similar to a camel that I did earlier. That's why we build what we like regardless of what TLG does. I've always built non-SW from time to time and will still do. Looking from the inside out, you'll have a clearly different view. Did you notice that they were all standing? The Nativity scene would've gone over the minifig limit. Sculptured to fit those minifigs. The priest was probably the one that took the longest to find the appropriate head.